I’m 62 years old and playing better now than ever because of something that happened to me just over five years ago. In sharing the following steps to this method that unfolded over time, I suggest that it can and should be tailored to the individual circumstances of each player. 1. Get a 99 percent certain diagnosis of a fatal disease from three doctors. You will need to find a surgeon immediately. Pick a great hospital and surgeon. I chose Beth Israel Medical Center and Dr. Martin Karpeh Jr.
2. Have the surgeon tell you your best-case scenario is a 3.9 percent chance of living more than two years. 3. Halfway through the surgery, have a “frozen section” procedure done that indicates the mass is benign. 4. At the end of the operation, while the surgeon is in the waiting room telling your spouse the incredibly good news, have his beeper go off telling him to get to the Surgical Intensive Care Unit (SICU) immediately. 5. Within a minute of leaving the O.R. for the ride to the SICU, have your blood pressure drop precipitously to the point of being imperceptible, then within a minute of arriving in the SICU go into cardiac arrest, and stop breathing. This is called “a complete cardio-vascular collapse.” You will now be clinically dead. (The other medical definition of death is “permanently dead.”) Make sure the SICU is one of the best and make sure a great doctor like Dr. Marvin McMillen is the SICU director. 7. Brain damage begins at the three to four minute mark. Two minutes of clinical death was then followed by 17 minutes of brain ischemia — dilation of blood vessels to the brain, which causes tissue damage. 8. Following that, have the team put you into a medically-induced coma. Make sure the coma lasts at least six days and that in the first three days, nobody thinks you’ll survive. 9. In the middle of the third day, your spouse will realize you are now close to death. She will know this from the monitor over your bed and from overhearing what the doctors and nurses are saying. 10. Your spouse now needs to have an inspiration born of desperation, an epiphany that the only thing that may be able to save you is music. Your spouse must feel certain that music is the only thing that can reach into your soul and give you the will to live. 12. As the music plays, you will stabilize for the first time in three days. This will allow the doctors and nurses to do things that would almost certainly have killed you while you were highly unstable. 13. Your life is now saved. 1. Three days later, now awake, your spouse will tell you what happened. Quickly decide to give back. 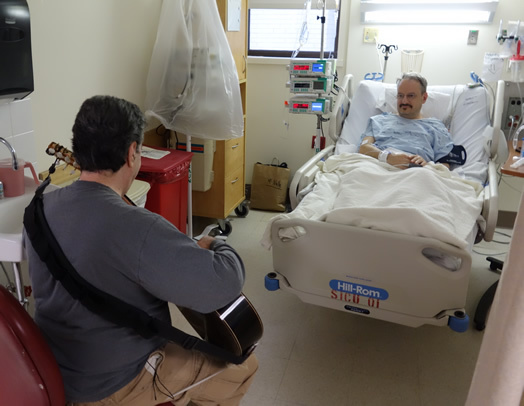 Realize that returning to the SICU to play music for the critically ill is the best thing you can offer. 4. From the first day, realize that this is more than giving thanks. You have found something you were born to do. (That’s a another story.) Dedicate yourself to doing this work three days a week, for 90 minutes each session. Within a year, a title will be created for you: Resident Visiting Artist. 5. 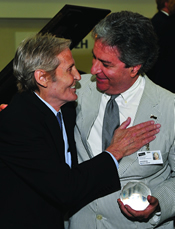 After two years of amazing experiences ranging from joyous to heartbreaking, with critically ill patients, their family and friends, and the camaraderie and on-the-job training from the medical and music therapy staff, conclude that time period with the wonderful experience of sharing an award stage with Levon Helm, the drummer and lead vocalist of The Band. You and Levon will be co-recipients of the Armstrong Center’s “Wonderful World” award. Then be invited by Levon to be his guest artist at his Midnight Ramble in Woodstock ten days later. 6. Wake up the morning after the Ramble and have a funny feeling something has changed in your brain. Take out your favorite solo piece, a six-minute Bach fugue, which you thought you’d never play again, and re-memorize it in 55 minutes, something you could not have done remotely that fast before. 7. Freak out because you have no f***ing idea what’s going on! 8. Go to your steady gig that night, hear things in pieces you’ve been playing for over 35 years which you’ve never heard before, and freak out again because you still have no f***ing idea what’s going on! 9. Go to the Institute for Music and Neurologic Function, co-founded by Dr. Oliver Sacks, and Dr. Connie Tomaino (whom you went to college with). Repetition (three times a week). A focus on helping others (you’re not performing for a traditional audience and you don’t get frustrated with your own progress). 11. Your friend Dr. Tomaino will explain that your brain created a “workaround,” also known as “neuroplasticity,” after getting home from the hospital, allowing you to play and read. This happened even though your nerve network for memory was so badly damaged. You also learn that the brain doesn’t discard such a “workaround” once a nerve network is repaired. It folds it into the network. In computer terms, your brain wound up with a faster processor. She’ll tell you that if you hadn’t returned to volunteer in the SICU, your brain damage might have healed in five to 10 years – but probably never, because you’d likely have given up music within a year, out of frustration. The author (right) with Levon Helm, drummer and lead vocalist of The Band. Knowing how lucky you are, go to the max. Practice more than ever before – technique, ear training, music theory – the whole nine yards. You will now be playing better than ever. Important disclaimer: no doctor can guarantee that clinical death won’t turn into permanent death. And the brain ischemia thing can get way out of control. And so on. So this method may not be for everyone. As some of you may have guessed, everything above really happened. It is a true story of how music saved my life and how I became part of the world of music and medicine. My story inspired Josh Aronson, the Academy Award-nominated director, to produce a short documentary about my experience called “Andrew & Wendy” (See http://aronsonfilms.com/projects.html). For those fellow musicians who are interested, the film’s New York City premiere is on Nov. 19 at DOC NYC (see www.bitly.com/andrew-and-wendy). The Long Island premiere is earlier in the month, on Nov. 6, at the Gold Coast International Film Festival (see www.bitly.com/andrew-and-wendy-2). I’m also writing a book about this story for release in 2016. 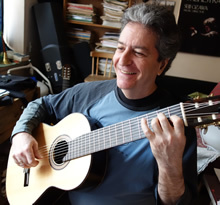 Guitarist Andrew Schulman first joined Local 802 in 1975. He has played steady engagements at The Plaza, The Mark and The InterContinental. His previous essay for Allegro was “The Kentucky Derby, the Mob, and Me,” which is archived at www.bitly.com/the-mob-and-me. His web site is www.AbacaProductions.com.